Based on a LED print engine developed by Oki, these A4 color MFPs are intended above all to serve medium and large accounts. Rolling out at three speeds (28/28 ppm for the MC760, 34/36 ppm for the MC770, 40/40 ppm for the MC780), these MFPs have a large range of features usually only seen on A3 machines. The optional external stapler, or the dfn models with an internal finishing unit will provide users with a means to produce finished color documents on a device which is quite compact given its feature set. Scan and copy jobs can be set up on the large (9 inch) touch screen, which will make it easy for new users to master the machine. 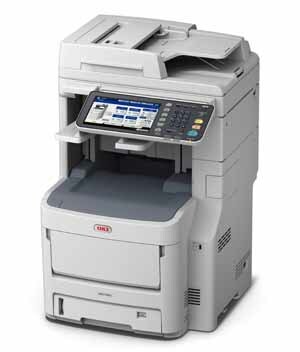 As announced previously on DataMaster.fr, the print controller on these machines has been developed by Toshiba Tec. Benefitting from the "Open Platform" technology, these MFPs are well suited for integration in business environments where a reseller or other third-party software vendor needs to develop special user interfaces, for example to set up scanning to company information systems, or to implement accounting or security systems restricting user access to both print and walk-up functions. The full technical specs, pros and cons and DataMaster analyses will be available to subscribers to DataMaster Online very shortly!